It is of necessity that I communicate to you and your office as Clerk of THE DISTRICT COURT FOR THE FIRST CIRCUIT HONOLULU DIVISION STATE OF HAWAII of Honolulu/Oahu County in regards to the above case, to give Notice and to make necessary public law demands for answer of questions, provide evidence of personum jurisdiction and otherwise, in the interest of justice, if it can be found within your office and corporate jurisdiction. 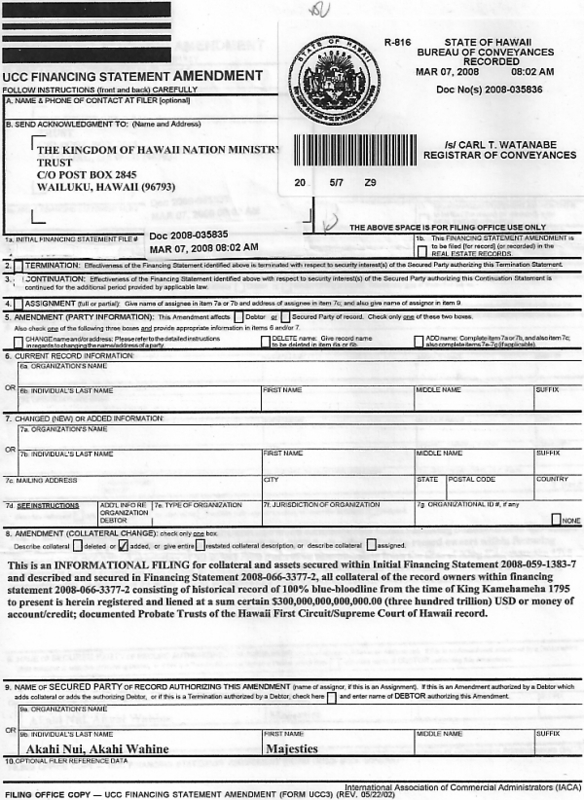 Please be advised that I have received an Administrative Citation(s) WARRANT or otherwise and the same is refused for cause without dishonor, whereupon it is required upon you or your office (or legal counsel) to produce the/any contract, with bona fide signatures and your or other agent's delegation of authority to proceed in this matter as against any and all of the Undersigned. pillage, plunder and compel me/us into a foreign jurisdiction not contemplated by your restricting and limiting constitution, where upon in this matter, it is necessary for me/us to present points and authorities, of things foreign and confusing to me/us, and that I will request/DEMAND from you said clarification and otherwise so that the authority of the demand(s) of me to come into your foreign jurisdiction/court/venue or otherwise to be subjected and to pains, penalties, punishments or fines is fully and finally understood whereby full disclosure is then demanded to show that I am the subject and the object of your jurisdiction/venue and so-called government by and through contract or agreement or otherwise to prove personum jurisdiction. Notice; any reference to any court case(es), past or present is for reference only for your edification and application to you and your office/venue via Article 4 § 1 of the U.S. Constitution and the Pari material Rule as to application to all constitutions, revised statutes, etc..
CONTRACT MAKES THE LAW AND ALL LAW IS CONTRACT! Comment; I have not been noticed by the State of Hawaii or the First Circuit Court Honolulu Division of Oahu County that I was a signatory to the State Constitution, and therefore a party to that 'social compact.' (See Article I of Hawaii Bill of Rights). Question: How does the State Constitution operate upon me by and through the State legislature, by and through State statute(s) to compel me into your county court jurisdiction/venue/court to be subjected to fine(s), punishment(s) and prison? Question: How am I named in county or State statutes or am I specifically named therein and therefore HOW DOES THE LIABILITY OF THE STATUTES ATTACHE TO ME? Comment; Please provide documentation and/or evidence that the above points do not operate upon me or have been vacated by the State of Hawaii or the First Circuit Court Honolulu Division of Oahu County in its application to me. 4. "There, every man is independent of all laws, except those prescribed by nature. He is not bound by any institutions formed by his fellowmen without his consent." CRUDEN v. NEALE, 2 N.C. 338 (1796) 2 S.E. 70. Question: If I am not a signatory to the State Constitution, not a party to that 'social compact' and not named in the State statutes. How then am I bound to your private corporate courts? 5. Please produce the evidence that any of the Undersigned is/are under contract or agreement with the State of Hawaii by and through the indicia of a Driver License or any other contract that would establish both personum and subject matter jurisdiction over the Undersigned. Note: for reference, see; "Where a person is not at the time a licensee of the particular agency, his license having expired and he not having asked its renewal, neither the agency nor any other officer has jurisdiction of said person." O'Neil v. Department of Professions and Vocation, 7 CA 2d 398; Eiseman v. Dougherty, 6 CA 783. Questions: Since the Accused are not and I am not an 'artificial/corporate entity/person… by what authority do you interface or compel me/us into your foreign venue/jurisdiction/court… where no contracts have been brought forward showing bona fide signatures… and; am I a artificial corporate person or am I one of the sovereign people and a sentient man/woman? 1933, under the "Trading With The Enemy Act (Sixty-Fifth Congress, Session. I, Chapters. 105, 106, October 6, 1917), and as codified at 12 U.S.C.A. 95a. "The majority of the people of the United States have lived all of their lives under EMERGENCY RULE. 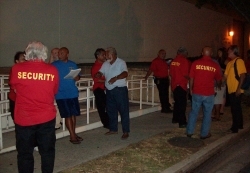 For 40 (as applied to date; 73) years, freedoms and governmental procedures guaranteed by the Constitution have, in varying degrees, been abridged by laws brought into force by states of national emergency..."
Question; is the First Circuit Court Honolulu Division of Oahu County and its corporate court, in this matter, breeching the freedoms and governmental procedures guaranteed by the Constitution of the Undersigned pursuant to the 'Oaths of Office' of the corporate officers of the First Circuit Court Honolulu Division of Oahu County? 8. U.S. Bankruptcy; It is imperative that you read Senate Report 93-549, 93rd Congress, 1st Session (1973), "Summary of Emergency Power Statutes", consisting of 607 pages, which I believe you will find most interesting. The United States went "Bankrupt" in 1933 and was declared so by President Roosevelt by Executive Orders 6073, 6102, 6111 and by Executive Order 6260 on March 9, 1933 (See: Senate Report 93-549, pgs. 187 & 594), under the "Trading with the Enemy Act" (Sixty-Fifth Congress, Sess. I, Chs. 105, 106, October 6, 1917), and as codified at 12 U.S.C.A. 95a. On May 23, 1933, Congressman, Louis T. McFadden, brought formal charges against the Board of Governors of the Federal Reserve Bank system, the Comptroller of the Currency and the Secretary of the United States Treasury for criminal acts. The petition for Articles of Impeachment was thereafter referred to the Judiciary Committee, and has yet to be acted upon. (See: Congressional Record, pp. 4055-4058) Congress confirmed the Bankruptcy on June 5, 1933, and impaired the obligations and considerations of contracts through the "Joint Resolution To Suspend The Gold Standard And Abrogate The Gold Clause, June 5, 1933", (See: House Joint Resolution 192, 73rd Congress, 1st Session) The several States of the Union pledged the faith and credit thereof to the aid of the National Government, and formed numerous socialist committees, such as the "Council Of State Governments..."
U.S. CONSTITUTION - ARTICLE I, § X, "...No State shall make any Thing but Gold or Silver Coin in tender of payment of debt..."
QUESTION: Is Oahu County and this court bound to uphold, support and defend the U.S. Constitution as the Supreme Law of the Land? 9. Article I, Section X - U.S. Constitution; No State shall; ...make any thing but gold and silver Coin a Tender in Payment of Debts..." and Article 11, Section I, Hawaii Constitution; "The Legislative Assembly shall not have the power to establish, or incorporate any bank or banking company, or monied (sic) institution whatever; nor shall any bank company, or institution (sic) exist in the State, with the privilege of making, issuing, or putting in circulation, any bill, check, certificate, promissory (sic) note, or the paper of any bank company, or person, to circulate as money." Question; is not the State of Hawaii and the First Circuit Court Honolulu Division of Oahu County in violation of Article 11, Section 1 of the Hawaii Constitution and of Article I, Section X - U.S. Constitution? 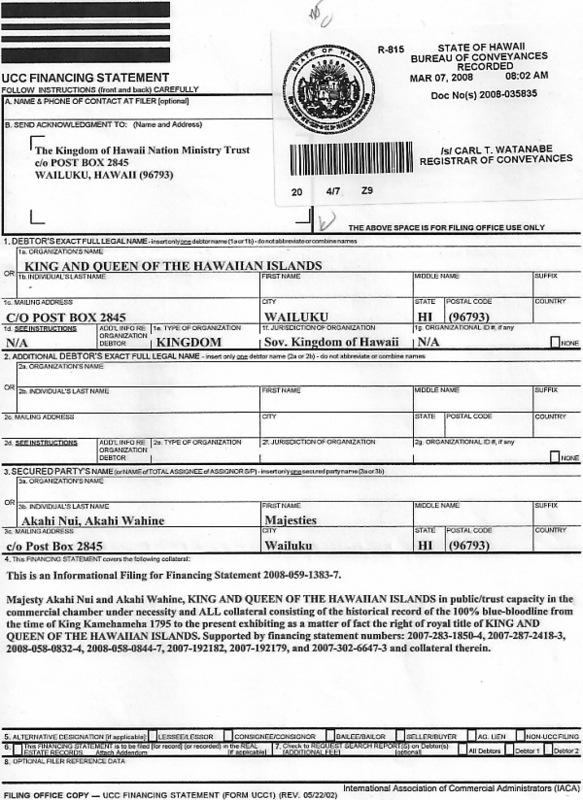 Question; Please provide the evidence that the Undersigned, in his private, sovereign capacity does not have a right to travel upon the highways in his ordinary course of life and (private) business and can be compelled by force to enter into an agreement with the State of Hawaii or with Oahu County? THEREIN; it appearing from the Penhallow case (See #6 above), this court can only deal with and interface with corporate, artificial persons and from the time of the U.S. Bankruptcy (See #8), the 'State' (meaning the federal government and the states) took the Birth Certificates not only for commercial purposes but took the names there-from and created 'corporate entities - fictions and corporate persons, and without full disclosure to the American people and this Undersigned, created this/a 'artificial corporate entity/fiction/person, for ALL commercial activities/transactions and maintained or required this 'corporate name' be used in all commercial matter(s)/transactions within the State or with the corporate Court of Oahu County. Whereby this 'corporate name' appears on driver licenses, permits, marriage licenses, bank accounts (both savings and checking), on all other accounts or transactions in commerce, in capital letter form or otherwise. And this corporate entity/fiction/person's name appears on all WARRANTS, COMPLAINTS, INFORMATIONS AND INDICTMENTS... as the artificial/corporate State/County/Municipal Court can only "interface only with other artificial persons", therein the Undersigned sentient 'Man Upon the Land' IS NOT THE PERSON NAMED OR IDENTIFIED on the citation, complaint or otherwise... for the purpose of the State/County/Municipal Court to COMMERCIALLY CHARGE the 'man' (Undersigned!)... but solely for State, County, or Municipal Court to COMMERCIAL CHARGE the artificial corporate person in their artificial abstraction, and imaginary venue/courtrooms for the purpose extracting revenue and taxes from the corporate entities. 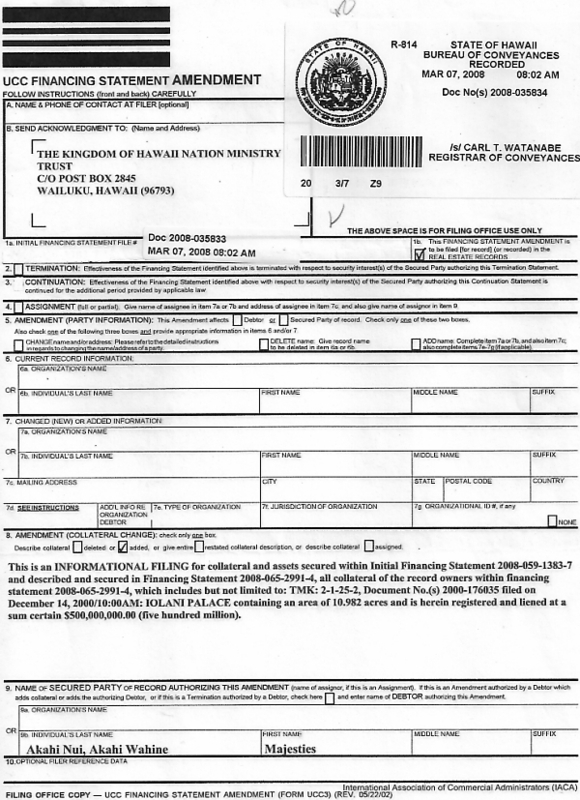 Without such full disclosure, IT APPEARS that ALL/ANY of the Undersigned sentient Men/women is/are not so named on the WARRANT/CITATION, any Contract or otherwise, but is made to believe he/she is, and is made to believe that he/she is liable to the statute and made to believe that he/she is to 'Pay' a fine, fee, tax or otherwise and/or go to jail, being made the surety to the corporate entity/fiction/person, all without full disclosure. It therefore must be presumed that the State and/or Oahu County DISTRICT COURT FOR THE FIRST CIRCUIT HONOLULU DIVISION STATE OF HAWAII never had jurisdiction over the private, sentient, sovereign 'Man/Woman Upon the Land' in the first place, therein the need to create some device or trick to make the people and the Undersigned 'believe' they were and are subject to the jurisdiction of any of these so-called (corporate) courts, these being merely 'private corporate military commercial tribunals,' acting as courts to 'administer the bankruptcy/National Emergency' to further effect the taxing of the 'artificial persons) people for the extraction of vast sums of revenue for the benefit of the government corporations; whether municipal, county, state or federal... in a continuous state of commercial economic involuntary servitude. Question; is this not True, please provide the evidence contrary to the above 4 paragraphs? It appears that there is lack of full disclosure, fraud, fraud by Scienter in the day-to-day operation of the so-called court(s) merely for the subjection of the corporate rule upon the sentient people and the Undersigned to foreign statutes and the extraction of so-called revenue/money via fines, etc., causing in many cases extreme hardship and/or casting 'men' in jails and prisons as the 'surety' for their commercial scheme/game where in their artificial abstraction/ artificial corporate venue, they being a creature of the mind only, and imaginary, having neither actuality nor substance commits 'constitutional impermissible application of the statute... and fraud. And on top of it, the prosecutor never files a Notice of Appearance; no Notice of Claim, supported by affidavit, into a maritime court via for an action in Rem with evidence of the contract and all attorneys fail to submit/file a Power of attorney on the case. More fraud? And none of the attorneys have or can produce a license to practice law, a violation of State statute. Question; Is this your custom and policy and if the above paragraph is not true, please provide the evidence contrary to the above paragraph? And from the standpoint that the Undersigned is not signatory to the Federal or State Constitutions, and therefore not a party to that 'social compact,' not named in the statutes and where no officer/agent/employee of any said government has produced evidence of my 'liability' to the statute(s)... there was never personum jurisdiction at any time, furthering gross fraud and misapplication of statute by mere de-facto corporate agencies; municipalities, counties, states and their corporate courts, etc., to the detriment and injury of the Undersigned. And then… in these de-facto corporate courts, agencies or otherwise, these 'administrators' of the bankruptcy/national emergency (in a state of receivership) impose fines, fees, taxes or otherwise (jail/prison) in so-called 'money' in violation to Article I, § X of the U. S. Constitution and Article 11, § 1 of the Hawaii Constitution which operates (on all state constitutions via the Pari Materia Rule) on officers of the First Circuit District Court Honolulu Division of Oahu County via YOUR Oath(s) of Office, causing more fraud and causing the people and/or the Undersigned(s) to being a 'Tort feasor' (wrong doer) in collusion to the fraud of the officers of this court, state or otherwise. (a) Also referred to or referenced by various city, county, state, and federal agencies as GRACE AKAHI, MOKIHANA AKAHI, AKAHI WAHINE, VANESSA FIMBRES, FIMBRES, NAKOA KAAHUNUI, N. KAAHANUI , KAMALANI KAAHANUI, K. KAAHANUI, TANYA KAAHANUI, LOKE NUNES, WAYNE NUNES, including all derivatives thereof. (b) An abstract legal construct; a government, created artificial entity; ens legis/trust; corporate, juristic person - the same being the opposite of, or opposed, to a God created living human being. (d) A Debtor, as defined and/or may be filed against pursuant to Article 9 of the Uniform Commercial Code; "One who may be compelled to pay a claim or demand." See "Debtor" - Black's Law Dictionary 6th Edition, page 404. Also, a Debtor to the Secured Party/Creditor "Upper and lower case spelled names" as evidenced per UCC-1 financing statement's, the same being registered/recorded with the Washington State Secretary of State/DOL and some out of necessity in Bureau Of Conveyances Hawaii. (e) The ALL CAPITAL APPELLATION is identical to that used in other business, corporate, or commercial entities such as ABC; CBS, WASHINGTON DC, UNITED STATES, etc. When wrongfully applied to Affiant "Wilbur-Pride: Jones", such ALL CAPITALIZATION appellation operates in complete contradiction to the proper name/noun prerequisites (Upper and lower case) of the English language as was the perpetual custom in America, e.g., George Washington, Thomas Jefferson, Ulysses S Grant, Robert E Lee; or biblically speaking, e.g, Moses; Holy Spirit, Jesus Christ; and elsewhere, e.g., Julius Caesar; Christopher Columbus. See also, All 56 signatures/signatories of original "Declaration of Independence" July 4, 1776. (a) ALL living, sentient, male/female human beings, live births on varying dates of the family/surname of different origins and given the name's above, as evidenced by Certificate of Birth Documents recorded with the State of Washington and BOC Hawaii. (b) A living, breathing, God created flesh-and-blood man/woman/human being, as distinguished from an abstract legal construct such as an artificial entity; man made juristic person; corporation, partnership, association and the like, nor is Affiant "Akahi Wahine, Vanessa Fimbres, Nakoa Kaahunui, Kamalani Kaahanui, Lokelani Nunes, Wayne Nunes" a creature of statute, i.e., not a "Person" as defined/applied in the 14th Amendment to the Constitution for the United States, including the fallout and/or wrongfully presumed nexus emanating therefrom. (c) A sovereign, freeman/woman upon the land of the several united States of America possessing the power of sovereignty. (d) A Creditor and Secured Party, as opposed to being a Debtor, being evidenced per UCC-1 financing statement's as registered/recorded with the Washington State Secretary of State and BOC Hawaii on different dates. (e) A Creditor and Secured Party having Pre-Paid Preferred Stock and Exempt from Levy, as evidenced by Washington State UCC filing No. 's and BOC Hawaii, UCC Contract Trust Account and Exemption Identification, the same being established with and verified by the U.S. Department of Treasury. (f) As a believer, servant, and steward of God Almighty and fellow heir of Affiant's King, Lord, and Savior Jesus Christ, it is against Affiant's ("Akahi Wahine, Vanessa Fimbres, Nakoa Kaahunui, Kamalani Kaahanui, Lokelani Nunes, Wayne Nunes") most firm religious spiritual convictions, beliefs, and God's written word to accept/condone being wrongfully classified/charged as a statutory person, creature of statute, or man-made/created entity/fiction of any nature whatsoever; nor, have Affiant's proper Christian name dishonored in any fashion (including the incorrect appellation thereof) contrary to the identical, correct appellation of my Lord and Savior Jesus Christ, and Affiant s "Akahi Wahine, Vanessa Fimbres, Nakoa Kaahunui, Kamalani Kaahanui, Lokelani Nunes, Wayne Nunes". (a.) That the Federal and State Constitution(s) operate upon me/us, a private man/woman. (b.) That I am or we are a signatory to the State Constitution. (c.) That I am or we are a party to that 'social compact' (the constitution). (d.) That I am or we are named in the state statues. (e.) Proof of my/our liability to the statute(s). (f.) All contracts, implied, adhesion, or otherwise, bearing bona fide signatures of any and all of the Undersigned. (g.) That the Rights stated in Hale v. Henkle (#3 above) does not apply nor operates upon any of the Undersigned. (h.) Evidence that any of the Undersigned has waived and given consent to be bound by State institutions or otherwise. (i.) That any and all of the Undersigned is/are not one of the sovereign people, which is above government and not found within that/this corporate government. (j.) That any and all of the Undersigned is/are in their 'flesh and blood/sentient private capacity' is/are a/an ARTIFICIAL ENTITY/PERSON subject to the jurisdiction of this court. (k.) That any and all of the Undersigned has not lived all of his/her life under EMERGENCY RULE. (See #6 above). (l.) That the freedoms and governmental procedures guaranteed by the Constitution, that would operated upon the Undersigned, have not varying degrees, been abridged by laws brought into force by states of national emergency. (m.) That the U.S. Bankruptcy has been terminated, that U.S. Constitution -Article I § X is in full force and effect and operates upon this State/court/jurisdiction. (n.) That the Undersigned has lawful constitutional money to pay debts at law. (o.) That the elected officials, officers, clerks and otherwise of this court/jurisdiction have not violated their Oath of Office as to U.S. Constitution -Article I § X. (p.) That any and all of the Undersigned being a private man/woman upon the land, that his/her Rights and power have been limited by the State via full disclosure and lawful authority of the State. (u.) That this court is not foisting upon any and all of the Undersigned to a commercial scheme to extract so-called money or compel the Undersigned into a status of surety to commercial charges for revenue purposes only via statutes that do not operate upon the Undersigned. (r.) That you and your office/court operates per sovereign authority. (s.) That as Clerk of Court for the District Court for the First Circuit of Oahu County, please sign and certify attached Certificate of Authorization that you have been authorized to make, receive, to issue judgments, to make demands for payment and/or to collect payments and/or debts in something other that gold or silver coin as mandated by the united States Constitution at Article I, Section X, Clause 5; "No State Shall… make any thing but gold and silver coin a tender of payment of debts" and I will not in way conspire to force the Accused 'Defendants' to be a tort feasor. Please understand that it is necessary that you respond to this NOTICE and DEMAND and in respect to the Refused for cause without Dishonor, you are required to exhibit the contract (or agreement(s)), the contract bearing Bona fide signatures and your delegation of authority. As to your authority, jurisdiction, constitutional or otherwise, the above points and questions are to be answered, demand is made as necessary for answers and/or in the nature of Public Law Demand for said response to the points and questions answered. As I/we want to resolve this or any matters dealing with any fine, fee, tax, debt, court judgment or otherwise with your so-called District Court, I/we can do so only upon your 'official' response by you or your office providing the requested response and answers. That any and all of the Undersigned(s) IS NOT/ARE NOT a signatory to the State Constitution. That any and all of the undersigned IS NOT/ARE NOT a party to that Social compact (State Constitution). That any and all of the undersigned(s) is/are not named in the State statutes. That any officer of the State of Hawaii, this court, any prosecutor or yourself have failed to prove how any LIABILITY of the private corporate statute(s) apply or operate upon the Undersigned. The State Constitution does not operate upon any of the Undersigned. That any and all of the Undersigned IS NOT bound by any 'state' institution(s) formed by his fellowmen (in times past) without his consent. That any and all of the Undersigned(s), as one of the Sovereign people cannot be named in any State statute as merely a "person" or "any person"
That the 'state' or 'county' government is an artificial person, an abstraction, and a creature of the mind only, and can interface only with other artificial persons, and the legal manifestation is that no government, as well as any law, agency, aspect, court, etc. can concern itself with anything other than corporate, artificial persons and the contracts between them. That any and all of the 'Accused'/'Defendant's' at any time as identified on a WARRANT/citation, complaint or otherwise is the corporate, artificial person (Ens legis) as is being commercially 'charged' and 'prosecuted' within a corporate fiction court. That any and all of the Undersigned IS NOT/ ARE NOT an 'artificial/corporate entity/person… and therein the Undersigned is foreign to the corporate, artificial courts venue/environment. That the Undersigned is therefore outside of the requirements of the statute(s) and above State government being One of the sovereign having no contract with the municipality, county or State or any contract with this court. That the United States went "Bankrupt" in 1933 and was declared so by President Roosevelt by Executive Orders 6073, 6102, 6111 and by Executive Order 6260 on March 9, 1933. That the State of Hawaii pledged the faith and credit thereof to the aid of the National Government, and formed numerous socialist committees and became insolvent and aided and abetted the removal of gold and silver coin from backing the nations money. That Oahu County and its court is violating Article 1, Section 10 of the U.S. Constitution and Article 11, Section 1 of the Hawaii Constitution (via the Para material rule) in allowing federal reserve notes to be circulated and accepted by you as Clerk of Court for Oahu County. That there can be no limitation on the power of the Undersigned, in his/her private capacity where on contract exists with government, county, State and federal. That the points stated in #11 above are true and correct as applied to the commercial scheme being orchestrated upon both the artificial corporate person and the Understand. THEREFORE you as Clerk of Court for the DISTRICT COURT FOR THE FIRST CIRCUIT HONOLULU DIVISION STATE OF HAWAII agree that the WARRANT/ citation/complaint only initiated an 'action' and the same was/is filed only upon and against an artificial corporate fiction/person within a commercial scheme… and not upon the Undersigned in his/her private sovereign capacity and that the commercial 'charges' can only be discharged or otherwise settled via set-off. Request and demand is made that you produce and provide a certified copy/ies of your Bond and the same of the judge(s) within your county court. Please be advised that if no bonds are found on the record to bond you and the judge(s) performance, you and the judges holds no office of authority and you are personally liable. Request and demand is made that you produce and provide a certified copy/ies of your 'Oath of Office' and the same of the judge(s) within your court. Please be advised that if no constitutional 'Oaths of Office' are found on the record, both you and the judges may be impersonating a public official and committing fraud within the office you hold. If any citation or complaint has been filed into this court to initiate or commence any such action against any and all of the Undersigned and if such action presumes there is a license and/or contract with the county, State or otherwise to give or establish jurisdiction to the county or the State to give this court subject matter jurisdiction, DEMAND is made herein that as an agent/officer/employee of the State that you request, acquire and produce any and all licenses issued by the county or State to the Undersigned or any and all contracts or agreements between the Undersigned and the county or State, being duly signed. The undersigned respectfully requests that you as Clerk of Court for the District Court For the First Circuit Court Honolulu Division State of Hawaii Oahu County, due to the urgency of this matter, reply within 7 days in providing a response 'point by point' and answers to all questions herein both to the Undersigned and a copy to the Notary as addressed below, by certified mail. In light of the points, facts and questions presented, it appears that I/we cannot enter into your so-called court house as no business is directed to me/us, not having a contract with your court or the State. As secured party creditor, I/we accept for value the commercial charges as charged against the Accused/Defendant (Ens legis) artificial person and reserve my right to set-off or discharge the same. LOKELANI NUNES, WAYNE NUNES ©, Ens legis. In the matter of the above Case Numbers;________________________________________________, ETC. I, _______________________________as Clerk of Court for THE DISTRICT COURT FOR THE FIRST CIRCUIT HONOLULU DIVISION OAHU COUNTY, Hawaii, an agency of the State of Hawaii; having taken a Constitutional Oath of Office, as Clerk of Court, to support and defend the U.S. Constitution, especially at Article I, Section X, and I herein certify under penalties of perjury that I have been authorized by the Mayor of the City of Honolulu, or by the State of Hawaii Legislature and/or by and through Executive Order of the Governor of the State of Hawaii to make, receive, to issue judgments, to make demands for payment and/or to collect payments, fines and/or debts in something other that gold or silver coin as mandated by the will of the people as stated in the united States Constitution at Article I, Section X, Clause 5; "No State Shall… make any thing but gold and silver coin a tender of payment of debts" and I will not in way conspire to force the 'Accused''Defendant's' to be a tort feasor. Notary, that _______________________Clerk of Court for the District Court for the First Circuit of Honolulu County is known by me or was properly identified before me. As such, be advised of; "Where a person is not at the time a license of the particular agency, his license having expired and he not having asked its renewal, neither the agency nor any other officials has jurisdiction of said person," O'Neil vs. Department of Professions and vocations, 7 CA 2d 398; Eiseman vs. Dougherty, 6 CA 783. "It is an elementary rule of pleading, that a plea to the jurisdiction is a tacit admission that the court has a right to judge the case, and is a waiver to all exceptions to the jurisdiction." "Anyone entering an arrangement with the government takes the risk that he who purports to act for the government stays within the bounds of his authority, even though the agent himself may be unaware of the limitations upon his authority." Federal Crop Ins. Corporation v. Merril, 332 U.S. 380, 1947. "It is not the function of our government to keep the Citizen from falling into error; it is the function of the Citizen to keep the government from falling into error." American Communications Assoc. v. Douds, 339 U.S. 382, 442. "SILENCE constitutes fraud when there is a duty to speak." US v. Twell, 550 F2d 297, 299-300.